If you dream about having a home interior that is effortlessly chic, timelessly elegant and oozing with neutral tones that echo nature, than The White Company is the place to go in order to achieve this aesthetic. The White Company is a lifestyle brand that burst onto the scene in the late 1990s, founded by entrepreneur Chrissie Rucker. It started out selling homeware in soft shades of white, and has evolved its offering to include hand-finished bed linen, clothing, children’s wear, candles and fragrance and gifts as well as seasonal treats. Its steadfast ethos is to provide its customers with everyday luxury items, made from the finest, snuggliest materials, while keeping the price tags at a sensible, affordable level. Whether you’re shopping in store, or online - The White Company’s chic, elegant, homely aesthetic runs through all its branding and product collections. If you’re entirely new to the virtues of shopping with The White Company, why not browse its blog pages, where you’ll find all sorts of amazing hints and tips for turning your home and wardrobe into a blissful, calming heaven. 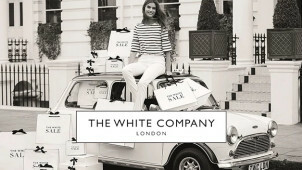 How do I use my The White Company shopping code? Click ‘shop now’, and wait to be redirected to The White Company website. Finish your shopping and head to your shopping bag. Enter your code in the box on the right, click ‘apply code’. Click ‘checkout securely’, then complete the remaining payment steps. Sign up to the mailing list and be the first to hear about amazing offers and flash sales. Does The White Company produce a brochure? Yes, you can request a brochure by filling in your personal info on this page. Can I buy The White Company gift cards? Yes, you can purchase gift cards on this page of the website. You can choose for the recipient to receive their gift in a physical gift box, or as an e-card via email. Where will I find The White Company size guides? You will find size guides for items such as men and women’s nightwear, bed linen, children’s shoes and pillows here. You have 30 days to make a returns claim. Read the full policy here. To find a store and its opening times, use this tool. When it comes to kitting out your home and wardrobe in a timeless, understated style and effortless elegance, The White Company is the only place to shop. If you have a White Company discount code, we’d recommend you use it to save some money on some super soft, beautiful hand-finished bed linen, seasonal themed, natural room fragrances and neutral toned home accessories. The White Company doesn’t just cater for adults with a penchant for tasteful interiors, their little ones can rock The White Company's trademark neutral tones too! The Little White Company pages of the website are decked out in clothing, pyjamas and accessories for newborn babies and boys and girls up to the age of 12. You’ll find the cutest patterns in the softest of cottons and other luxurious materials, and once you’ve got their wardrobe sorted - you’ll find it impossible to resist buying some nursery furniture and toys too! The White Company is proud to have been blending and manufacturing its own artisan candles and home fragrances for over 20 years. It sells sumptuous or subtle scenes to suit your mood and/or the season. We’d recommend you use a White Company promo code to stock up on candles from the bestselling Winter Collection which blends the iconic scents of cinnamon, clove and orange essential oils.